Allen Deming of Mackinaw Watercraft says his boats are lightweight and low maintenance. 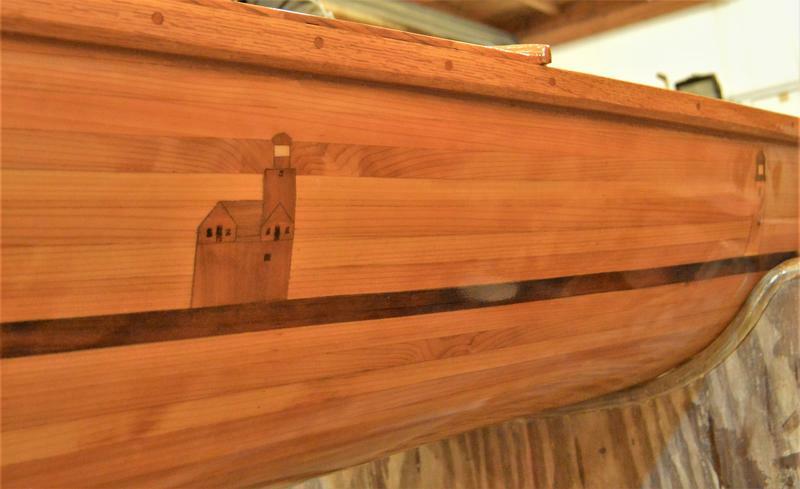 A Lake Michigan lighthouse themed boat by Allen Deming. Allen Deming at work on the latest Mackinaw Watercraft creation. Star inlays along the waterline of Deming's 9/11 boat. Listen to Allen Deming talk about the watercraft he's been building over the last ten years. A detail of Deming's 9/11 boat. Outside of Grand Ledge, at the end of a long driveway tucked away among the trees, we found a house and a large steel barn, the workshop of our latest featured artisan, Allen Deming of Mackinaw Watercraft. He’s been building monocoque strip built boats as a full-time pursuit for ten years. Monocoque strip built is basically a single hull canoe or a kayak or other vessel made from strips of wood glued together and then sealed with fiberglass and epoxy. “They have none of the problems that are inherent with wooden boats. So, if you grew up caulking your old Chris-Craft, or waxing and varnishing, or doing that sort of thing every year, that’s nonexistent here," Deming explained. The wood becomes a composite material with the fiberglass and epoxy. So, the wood never actually touches the water. The wood doesn't swell from moisture and the maintenance for the fiberglass encased wood boats is very low. "My boats range from a 12-foot kayak weighing 24 pounds to an 18-foot full four-passenger canoe that weighs 56 pounds. So, we keep them lightweight, they’re beautiful, but really easy to use," Deming said. How did he learn to build the watercraft? Books. He was in the corporate rat race and when he got a spare moment, he read about making boats while on airplane trips between business appointments. But, the authors didn't always agree on technique. A couple of examples of Deming's intricate paddles. The first guy said, ‘You have to do it exactly this way,’ and the second guy said, ‘You have to do it exactly that way,’ and the third guy said, ‘Those two guys are idiots. You can’t do it either of those ways.’ [I thought,] eh, if there’s room for these three guys, I can probably find room to do this," he said, laughing. During the last five years of boat building, things took a turn. Deming had always concentrated on building strong, seaworthy craft. But then, as he puts it, he started to "doll them up." 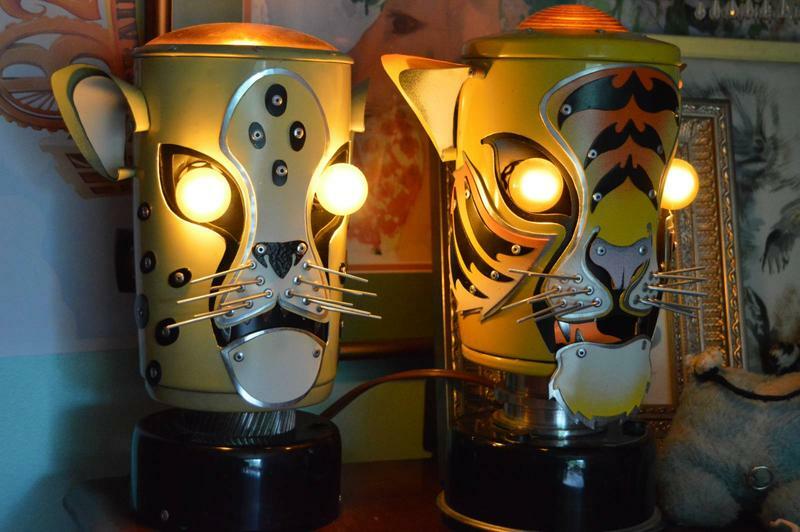 He’s always been a woodworker and he started incorporate ornate inlays. “I was inspired then to take that wood canvas which I think is – you know, obviously I’m biased – but one of the most beautiful backgrounds that exists for us and to start to put icons from nature in there," he said. He uses different pieces of veneer, different wood species. He said he does not use stains or dyes, just different types and color of wood in his images. "I’ve done loons, and sandhill cranes, and salmon, and turtles. The Art Prize boat that I did two years ago had turtles crawling all along the waterline on the side and their shells were Petoskey stones. So, not only have I been able to put some wood to different uses, but some other iconic Michigan items as well,” he said. You can see that boat here. 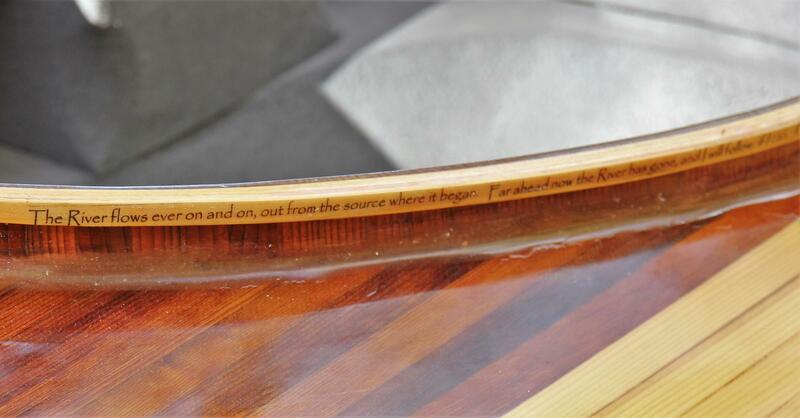 A detail of one of Deming's kayaks. Often his watercraft are now considered works of art, although he really wants to see those boats in the water rather than hanging on someone’s wall. 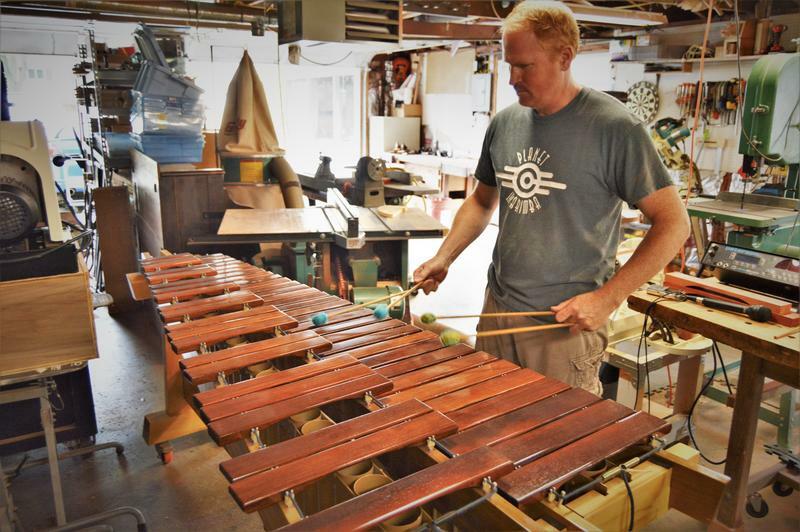 He uses sustainably grown wood or recycled wood – he calls it "upcycled." Friends, fans, family are always helping find material. He says when he was young, working in construction, he built a lot of redwood decks on homes. “Now redwood is pretty scarce and not much of it gets cut. So, if I want to use it in a boat, and it is a wonderful product to use, I’m having to look for it from recycled sources. So, it’s pretty shabby looking when I get it, but it ends up looking pretty good in a boat,” he noted. Deming also teaches people how to make their own watercraft. Some people really want to build their own rather than buy one. Some even toy with the idea of building boats for a living. “I advise every one of them that if you want to do this as a full-time pursuit, you should marry well,” he grinned. Support for arts and culture coverage comes from the Michigan Council for the Arts and Cultural Affairs. Listen to Thomsen talk about his boats and paddles. For several months now, we’ve been traveling around the state, talking to people who make useful things with their hands. We’re calling the series Artisans of Michigan. This time, we found ourselves in Tecumseh, in Mike Thomsen’s garage. Some people call him “Canoe Mike” because, among other things, he makes wood canoes.